Ricardo Salles (BA, Mexico 1990; MPhil and PhD, King’s College London 1993 and 1997) is a researcher at the Institute of Philosophical Research of the Universidad Nacional Autónoma de México (UNAM) since 1997. He was a fellow of Harvard’s Center for Hellenic Studies in Washington DC (2003–04) and a member of the Institute for Advanced Study in Princeton (2010–11). He also was the director of the journal Diánoia (issues 58–65), the director of Philosophy Postgraduate Studies at the UNAM (May 2007–August 2010) and the coordinator of the Greek Philosophical Texts Reading Group of the UNAM since 1997. His research work has centered on ancient philosophy and especially on metaphysics and ethics in Aristotle and the Stoics. Boeri, Marcelo and Ricardo Salles. Los Filósofos Estoicos: Ontología, Lógica, Física y Ética. Traducción, comentario filosófico y edición anotada de los principales textos griegos y latinos. Studies in Ancient Philosophy. Sankt-Augustin, Germany: Academia Verlag, 2014. Salles, Ricardo, ed. God and the Cosmos in Stoicism. Oxford, UK: Oxford University Press, 2009. Salles, Ricardo. Los estoicos y el problema de la libertad. México: Universidad Nacional Autónoma de México, Instituto de Investigaciones Filosóficas, 2009. Salles, Ricardo, ed. Metaphysics, Soul, and Ethics in Ancient Thought: Themes from the Work of Richard Sorabji. Oxford, UK: Oxford University Press, 2005. Salles, Ricardo. 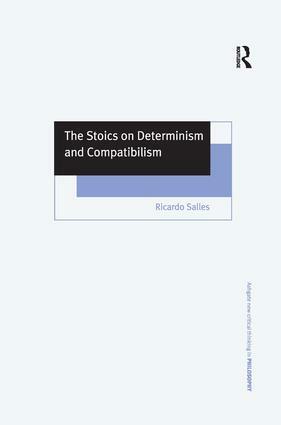 The Stoics on Determinism and Compatibilism. Farnham, UK: Ashgate Publishing, 2005.